A malignant brain tumor (red mass, left) of this person’s brain, wreathed by fine tracts of white matter. The red fibers signal danger: If severed by the neurosurgeon’s scalpel, their loss could affect the patient’s vision, perception, and motor function. Blue fibers show functional connections far from the tumor that are unlikely to be affected during surgery. Together, the red and blue fibers provide a road map for neurosurgeons as they plan their operations. Computer science graduate student Maxime Chamberland of the Sherbrooke Connectivity Imaging Lab in Canada produces images like these on a weekly basis, he says. Using an MRI technique that detects the direction in which water molecules move along the white matter fibers, he generates a three-dimensional image of functional connections in the brain. 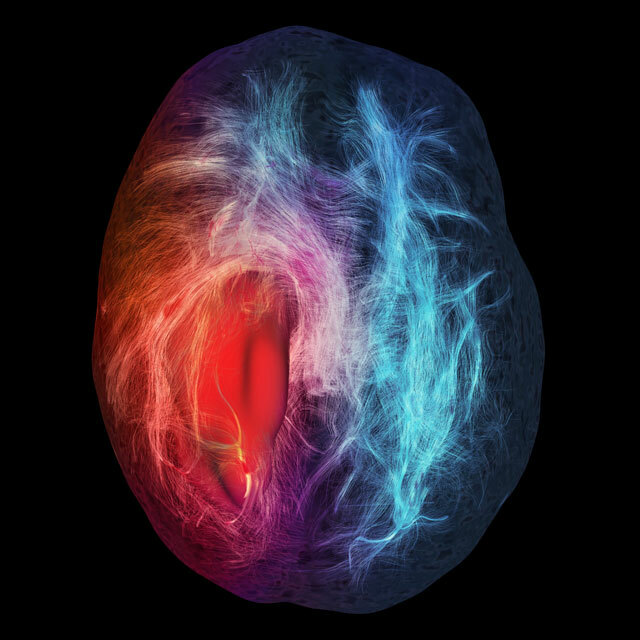 This image is an artistic rendering of Alya Red, a new computer model of the heart that marries modern medical imaging techniques with high-powered computing. 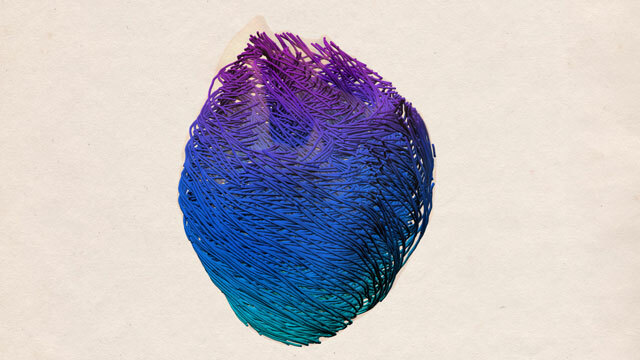 Based on MRI data, each colored strand represents linked cardiac muscle cells that transmit electrical current and trigger a model human heartbeat. Despite centuries of study, scientists are still largely baffled by the heart’s complex electrical choreography, says physicist Fernando Cucchietti, who helped produce the video. The most challenging part was to get the heart fibers in the image to move in a realistic way, Cucchietti says. Check out these and all the other winners here. If you’d like to compete in the 2013 challenge, the competition opens in February (tomorrow!) and the deadline for your submission is the end of September 2013. I suppose the theme of the 2013 IEEE Scientific Visualization Contest (a VisWeek 2013 event) is strictly speaking more biovis than medvis, but I thought I’d still mention it here, since the fields are so closely related. In any case, the theme for this year’s scivis contest is developmental neuroscience! There is a dataset available (the Allen Developing Mouse Brain Atlas) tracking the level of gene expression for 2000 genes in 6 stages, organized into 11 categories, in a 3D mouse brain. So that’s a grand total of 12000 expression energy volumes at your disposal. The challenge is to visualize gradients, structural patterns, structure consistency and complementary patterns for the complete dataset. If you’re up for participating in this contest, you can find more information here. The deadline for the contest is 31 July 2013.